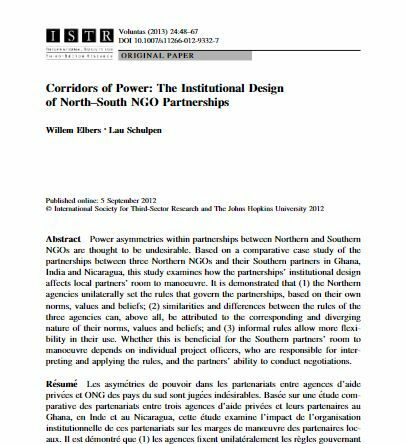 This article explores the effect of institutional design in partnerships between Southern NGOs (SNGOs) and Northern NGOs (NNGOs). The authors go beyond financial resources as the only explanatory factor for power imbalances, instead they argue that the regulatory framework consolidates and reproduces power relations. Although the case studies are diverse, the general findings indicate that: 1) unequal power relations are institutionalized by rules created unilaterally by NNGOs, 2) these rules are used to exercise power in day-to-day interactions, even more so than financial incentives, 3) in setting these rules, NNGOs’ norms and values are central, and 4) NNGOs use a similar set of rules (although different per NNGO) for all their partnerships. Informal rules offer opportunities for SNGOs to exert power, provided that they have the power to negotiate, are trusted, and depending on the project officer in question. To change power dynamics in North-South NGO relationships, it is important to: 1) address multiple rules at the same time (rules overlap, are intertwined and mutually reinforce each other) and 2) focus on creating alignment between an NGO’s norms, values and beliefs and these formal rules.